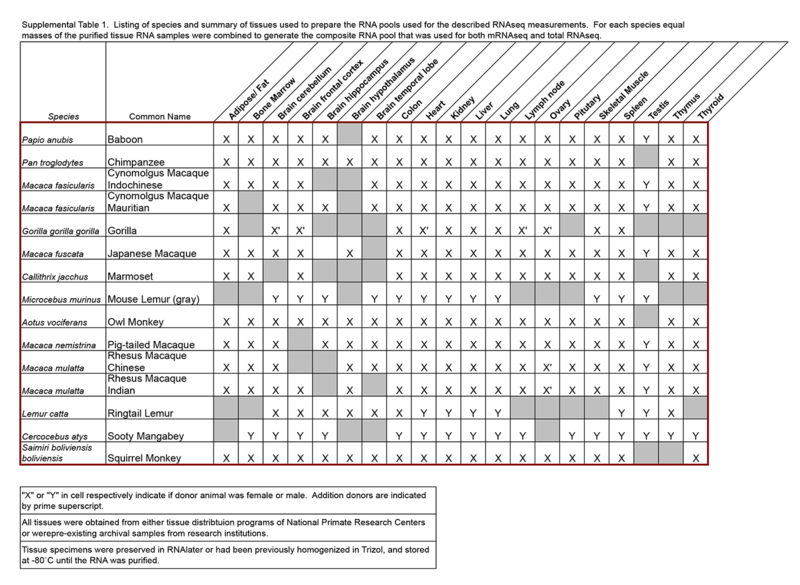 The Non-Human Primate Reference Transcriptome data (encompassing 14 species in total) is rolling out. The next generation sequencing of the initial species are complete. Access to the data is restricted to the members of the Non-Human Primate Reference Transcriptome Working Group (NHPTWG). The NHP reference transcriptome “first pass” manuscript, driven by the NHPTSC will be the first publication generated and accepted from this data set. No NHP reference transcriptome data may be included in support, in combination with other data or as the focus in a manuscript until an accepted “first pass” manuscript, as described in item #1, is announced. Data may not be disseminated outside of the NHPTWG and is restricted to your immediate research group. Assemblies, alignments, or any other processed versions, of the data, is restricted to the members of the NHPTWG. All future publications based upon these NHP reference transcriptome data must acknowledge the NHPTSC, and involve at least one of the members of the SC in the development of the publication. It is the responsibility of the individual NHPTWG members to distribute near final drafts of all future manuscripts to the NHPTSC for comment and review prior to submission of the manuscripts. The NHPTSC will commit to rendering their reviews within three weeks of receipt. It is the responsibility of individual NHPTWG members to discuss their work involving the NHP reference transcriptome data with the NHPTWG at large and to make available to the group assemblies, alignments, or other processed versions of the data that might facilitate further exploration and collaboration between NHPTWG members. Any problems or issues with the should be reported to: Christopher Mason (chm2042@med.cornell.edu). The NHPTWG members are defined as those who composed the initial working group involved in tissue acquisition and processing and those who compose the bioinformatics/computational group. Tissues were obtained as research resources from the following centers: Washington National Primate Research Center, Wisconsin National Primate Research Center, Oregon National Primate Research Center, Yerkes National Primate Research Center, Southwest National Primate Research Center, the Duke University and the Duke Lemur Center; the Keeling Center for Comparative Medicine and Research, the North Carolina Zoo, and Covance Inc.